Prenatal testing is one way for you to check in on the health of your baby during pregnancy. There are a number of different types of tests that you might undergo, each of which is designed for a different purpose. Some prenatal testing is done as part of the normal routine, such as a blood pressure test and a urine test. Other tests are only done during pregnancy if your doctor suspects there might be a problem with your baby. Blood tests. You will probably have a blood test when you first suspect you are pregnant in order to confirm the presence of hCG, the pregnancy hormone. This test may also check for risks for certain birth defects or heart trouble. Urine tests. During pregnancy, your urine will be checked for various elements, including signs that there might be a problem with you or your baby. Chorionic villus sampling (CVS). This test gathers tissue from around your baby in order to check for certain genetic conditions like Down syndrome. CVS usually takes place between weeks 10 and 12 of your pregnancy. If you’re older than 35, have a history of family genetic problems or if other tests indicate the possibility of birth defects your doctor may recommend this test. Ultrasound. An early ultrasound may be done to make sure you’re pregnant and determine your baby’s gestational age. More blood tests. 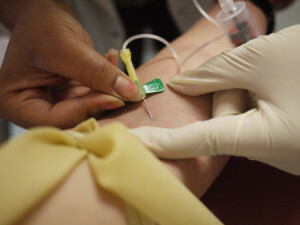 Second trimester blood tests look for other birth defects, and are usually done between week 15 and week 20. Amniocentesis. Also done between the 15th and 20th week of pregnancy, this test looks for various genetic abnormalities. Ultrasound. During the second trimester, your doctor will do an ultrasound to determine your baby’s gender and make sure she’s growing according to schedule. Glucose screening. Between week 24 and 28 your doctor will check to see if you have symptoms of gestational diabetes. The only new test you’re likely to have during the third trimester is a group B strep test, which will check for a certain type of infection that can be passed to your baby during birth.